This is the step where many folks leaving the military get stuck. Either they’re overwhelmed by all the possibilities out there and succumb to analysis paralysis - or they dive right in and just apply to thousands of jobs, never hearing back from one. 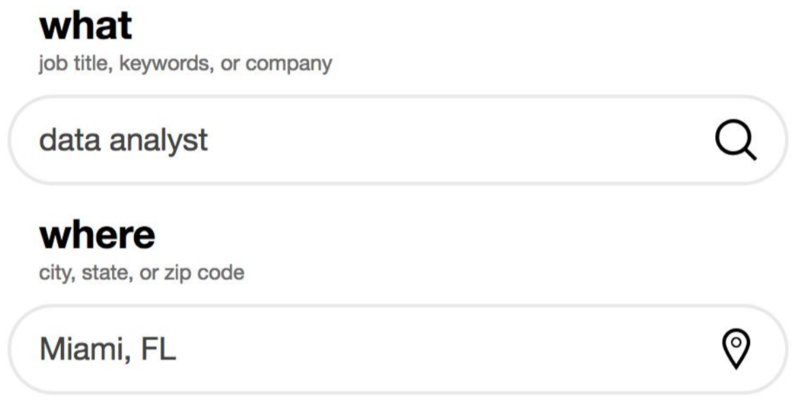 Head over to Indeed, the most comprehensive aggregator of job listings. And start with a simple search for your desired job title (e.g., Data Analyst) in your desired location (or leave that field blank if you’re open to moving anywhere). Let’s say that you realize that you’re only interested in roles at startups - not giant companies. Try adding the word “startup” to your search (e.g., Data Analyst startup) and see if you get a better ratio of signal-to-noise. Or maybe you discover that a lot of the roles are in the actuarial space and you’re just not excited about that. 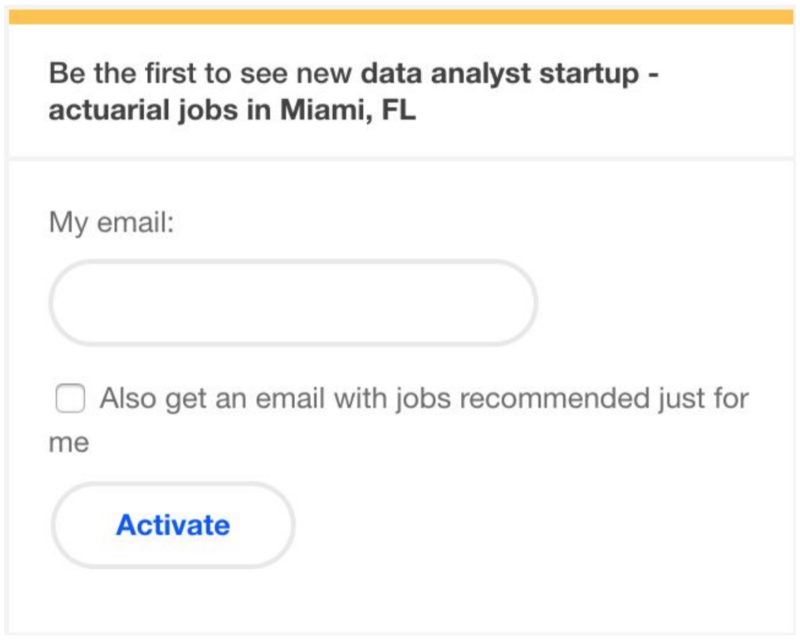 Go ahead and add “-actuarial” to your search (e.g.,Data Analyst -actuarial) to remove those listings. Once you feel like your search is returning a fair share of career gold, it’s time to automate. Rather than stressing out by checking job boards every day, let technology do the heavy lifting for you by setting a Job Alert in the right-hand column. Now, each day, you’ll get all the freshest jobs delivered straight to your inbox without lifting a finger. When a job comes in that strikes your fancy, be sure to hop on it right away. You’re likely to get more attention from a recruiter on the first day (when your application is like the shiny new present under the tree) than on the 21st (when he’s buried under 500 applications and has given up all hope)! Ideally, you should aim to apply for a job within 2 weeks of posting. 1) I'm obsessed with data. From analyzing reams of field data as an intelligence officer to teaching myself SQL and Python on the side out of pure passion, I love nothing more than discovering needles of insight in giant haystacks of data. 2) And I'm deeply passionate about your mission. Empowering others to provide for their families is something that’s motivated me throughout my life - from supporting communities around the world through the military to volunteering with Habitat for Humanity back at home. And by democratizing access to housing data, Zillow is making it possible for millions of people to find the perfect place to build and raise their own families. Thus, between being energized by the day-to-day work and the overall mission, I can't imagine a better opportunity to apply my data skills in the name of something truly meaningful! Do you know anyone at the company? To find out, set the Current Companies filter to your desired organization and Connections to 1st degree (i.e., people you already know). And if the answer is “Yes,” you’re golden! Just reach out to them and ask them to refer you for the role - this single piece of support doubles your chance of getting an interview. After all, a company would rather hire someone their existing team can vouch for than take a risk on a total stranger. Do you know anyone who knows someone at the company? Shine a light on those invisible connections by setting Connections to 2nd degree (i.e., you know someone you knows someone at the company). If you find results, ask your mutual friend to introduce you to the person on the inside - along with a short endorsement of your abilities. And then talk with the insider about the role you’re excited about and any advice they might have for getting it. Oftentimes, they’ll be happy to refer you based on the recommendation of the mutual connection. Does anyone from your branch of the service or school work at the company? To investigate, reset the Connection box and either add your branch to the Search box or your school to the School box. Then, if so, find their email address on Hunter.io and reach out with a message like the one below. I’m a (soon-to-be) Navy veteran and, as such, I was thrilled to come across your profile on LinkedIn. That’s because I’ve been excited about landing a Data Analyst role at Zillow and was glad to come across a fellow vet there. If you’d be open to sharing your story and your advice, is there any chance you’d be available for a 15-minute conversation later this week or next? Again, during your conversation, they’ll often offer to help based on your shared bond and passion for the role. Once you’ve got this process down, you should aim to apply to one job a day. Given that the chance of getting a job with a referral is about 6% (vs. .7% when you apply online alone), this should get you to a decent shot within two weeks. But it’s also not so overwhelming a task that you start to get bogged down and give up prematurely. So set your daily goal and stick to it. Before you know it, you’re likely to have multiple interviews, which will give you important leverage in the next stage.